Short story by Sue Callender. The nape of her neck expended tears of anxieties and fears. Recalling love had and love lost – not so appealing, and yet so enticing. Dalliances craved to the core of pleasure – few and far between. Her pensamiento turned to him – the boy next door. She once had a dream in which he beguiled her out of her clothes, and she came (in actuality). Nothing really happened, ‘twas solely the act of perhaps, the chance of maybe, the mere sound of yes. He had come over to work on their yard a few times; her flat mates said they knew him from school. And every time he would pull out his grandeur shears – skin so smooth, hair so fine, a countenance of soiled dreams entrapped in perfection. All she could do was grasp her notebook and coffee whilst she sat on the big beautiful cyclical bay window, her foot dangling. Her corazon went a flame, when her pensamiento turned to him. Her sentimiento could only be conveyed as the time of the butterflies. But, their rustling flaps angered her. Love did not reside within her, anymore. All too real – imprecations of past existences have brought her here. To this place of sullied Nirvana. Cobain-ing through life, the misery felt so right. The happiness felt so raw, so transient, so self-important. She hated that happiness. And it was more clear than the crystal that resides in the tomb of Great Love: Happiness hated her as well. And this actualization paralyzed her, breath heavy and oscillating against the big beautiful bay window. che giustifica solo se stesso. chi ti ama in modo diverso. alla ricerca di me stesso. del mio risveglio in un mondo di pace. 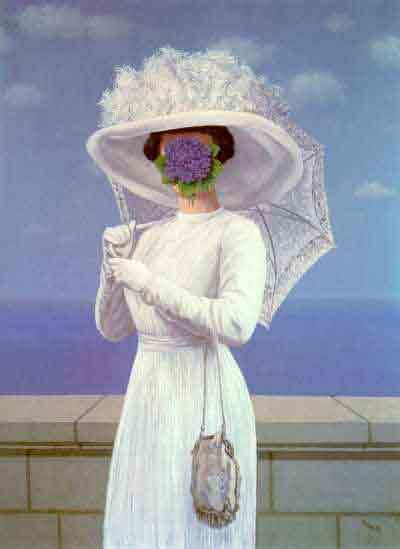 Immagine di Rene Magritte, The Great War (1964).